Originally a freelance journalist, Rosa Jordan has in the past 15 years published nine books: four non-fiction (two set in Cuba), four juvenile fiction (set in the US South), and Far from Botany Bay, her first novel for adults (set in England, Australia, and the South Pacific.) Whatever the form or geography, Jordan’s writings illuminate landscapes where social and political realities intersect with personal courage and compassion. Jordan grew up in the Florida Everglades, attended university in California and Mexico, and emigrated to Canada in 1980. 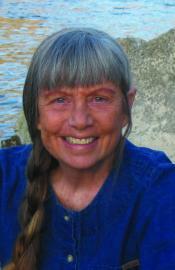 An environmental and social justice activist, she has been on the board of Earthways Foundation almost 20 years. In that capacity, she facilitated the development of an organic agriculture project in the mountains of Guatemala and a jungle cat reserve in Ecuador’s Chocó rainforest. She and her partner Derek Choukalos live, write, ski, and cycle in the Monashee Mountains of British Columbia.